I make dreams come true. That’s what I told G when I went with her to BCD Tofu House for some soon dubu (soon doo boo) – Korean spicy tofu soup – one of my all-time favorite Korean dishes. BCD Tofu House on Western. By the way, BCD stands for Buk Chang Dong in case you're Google mapping and see that and get confused because you never knew what BCD stood for. Just some advice. BCD Tofu House is a chain I frequented often in Seoul when I lived there my junior year in college. I loved it so much that I went for my 21st birthday. After moving back to the States, I always looked forward to going whenever I was in New York City. 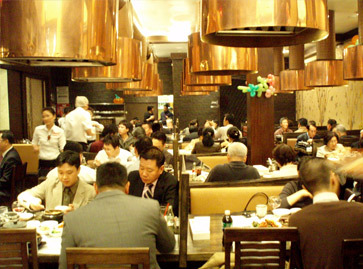 So very sad to hear that the Manhattan location is closing. BCD being 24/7, it was often the fourth or fifth stop of the night and an obscene hour once we got there. This is probably 5:30am on a Thursday in Manhattan. Oh, NYC, you really are a lot of fun, but you make me so tired thinking about you. G had never been to BCD before and told me it was her dream to go (her words, not mine). Naturally, me being the purveyor of dreams (and a HUGE fan of tofu), I went with her. 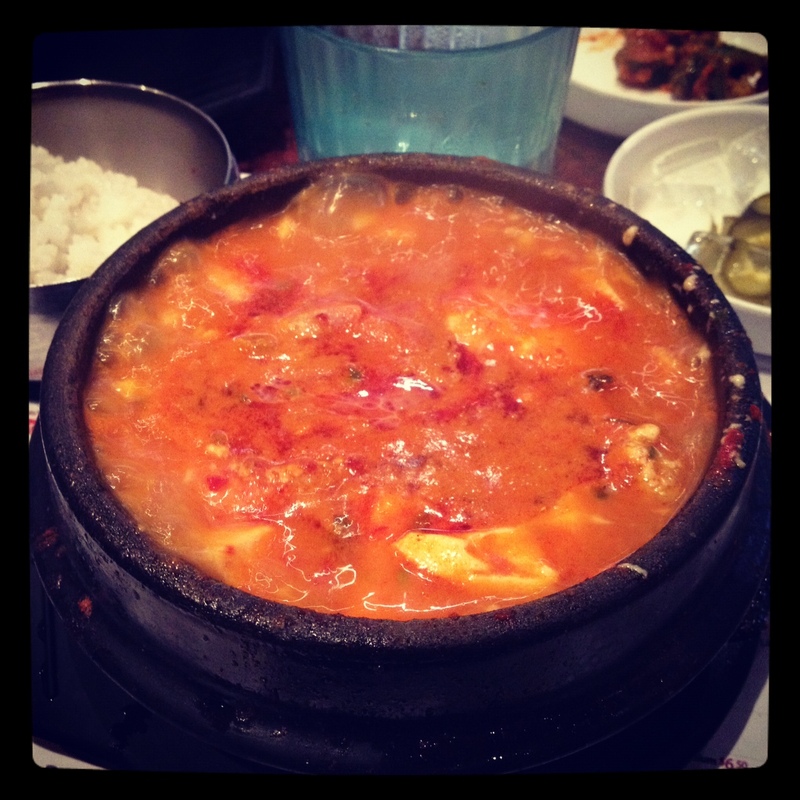 Soon dubu: spicy tofu soup. Soon dubu is best served spicy hot and piping hot. Like many Korean soups, it’s literally boiling when it comes out. Probably not very good for your insides, but it’s oh-so-tasty this way. But before diving in, you have to crack a raw egg in that baby and let it cook for a few seconds. Delicious. We both ordered the seafood variety and the total came to about $11 each with tip and tax. It was exactly what I needed. A bowl of hot soup with perfectly soft tofu. It came with some clams and shrimp, but not much. Not surprisingly, I remember the one in Korea to have much more (and better) seafood. Now I know that supposedly there is better soon dubu elsewhere, but I still love BCD. Maybe it’s the nostalgia factor. Maybe it’s the whole fried fish you get with your soup. Maybe it’s the noo roong ji (delicious almost-burnt rice at the bottom of the stone pot that you eat soaked in warm water). 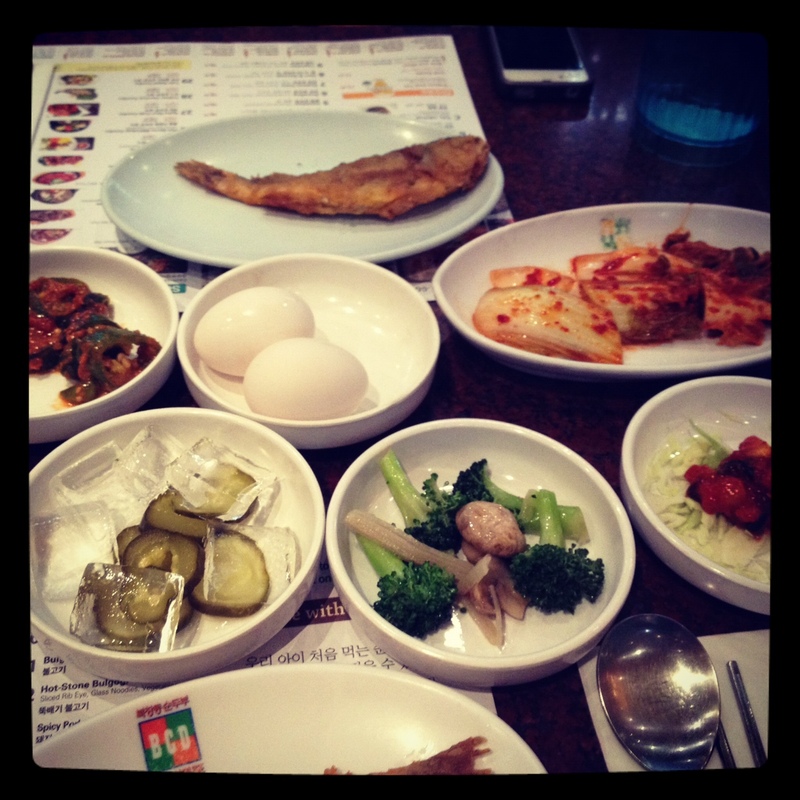 They also serve some of my favorite banchan (side dishes): cold pickles and jjut gal (fermented seafood). 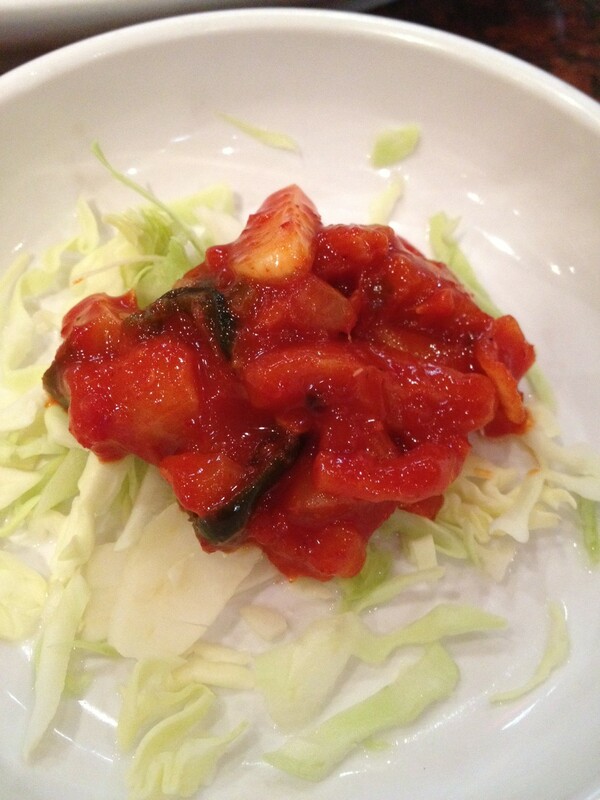 Ojinguh jjut gal (fermented squid). The wait for 2 on a Thursday night was about 25 minutes, but it was worth it. We came out ridiculously full and satisfied with the smell of Korean food coming out of our pores. Pretty gross and pretty awesome at the same time.